When Heavenly Sword has no equipped weapon, his attacking range is his health level. When another character uses an escape for Heavenly Sword's attacks, Heavenly Sword can place the escape in his hand. Heavenly Sword can choose to decrease all of his damage done to Cao Cao by one. If Heavenly Sword is damaged during his turn, his attack range changes at the same time. If the target of an attack uses the Eight Trigrams against Heavenly Sword, he does not get any cards from "Town of Wei". 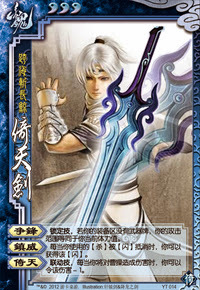 "Sword of Heaven" applies only to Cao Cao. No one else can use it's benefits. When it is used, Cao Cao still experiences the effects of being damaged, even if the amount was reduced to zero. This means that Cao Cao can use "Evil Hero" without taking any damage.